To give the grill a shinny background, add a piece of aluminum foil. Use the printed part as a template to guide an xacto knife to cut out the shape. A layer of glue stick will secure the foil to the grill. Let the sticky adhesives dry before applying a layer of super glue to the grill and onto the mask. Place the costume goggles over the top of the mask with the bridge piece in-front of the mask. With one hand, hold both the mask and goggles together then use the other hand to add a binder clip. Use a pair of pliers to remove the handles from the binder clip. The secondary respirators are attached to the mask with cylinderical pegs. These pegs are inserted into the holes of the secondary respirator parts. Strips of conduit are fitted into the large opening on the back of each secondary respirator. In this project we're using 26AWG silicone coated stranded wires for more flexiblity. Measure and cut six pieces of wire according to the photo. Strip and tin the tips of each wire. With all six wires striped and tinned, combine two pieces together to make a set of 3 wired. Secure the rings into place with a Panavise Jr or third-helping hand to assist you while soldering. 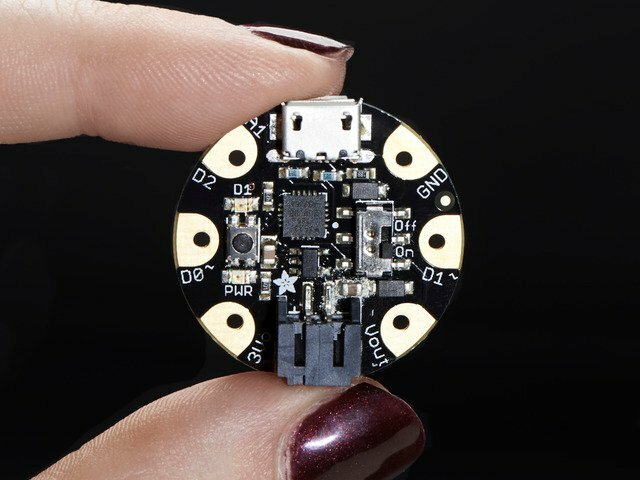 Tin the data, ground and power pins on the NeoPixel ring. Solder the wires to the 16 and 24 NeoPixel Ring. Before inserting the rings into the mount, ensure the side with the cylindical walls is facing up. 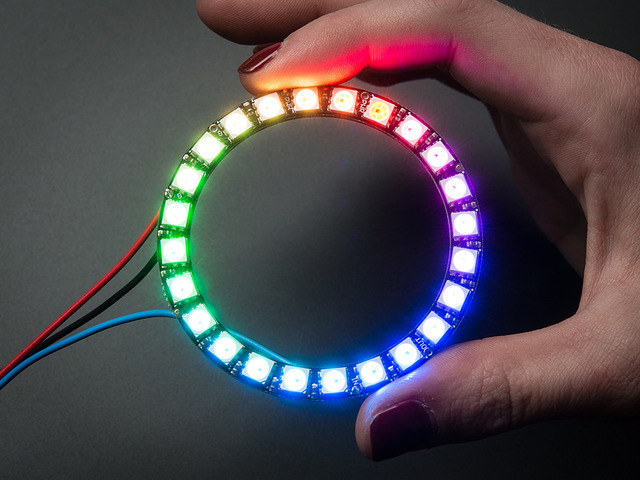 Insert the 16 NeoPixel ring into the part with the wires threaded through the openings. Pull the wires all the way through and press the ring inside the channels snaping it into place. 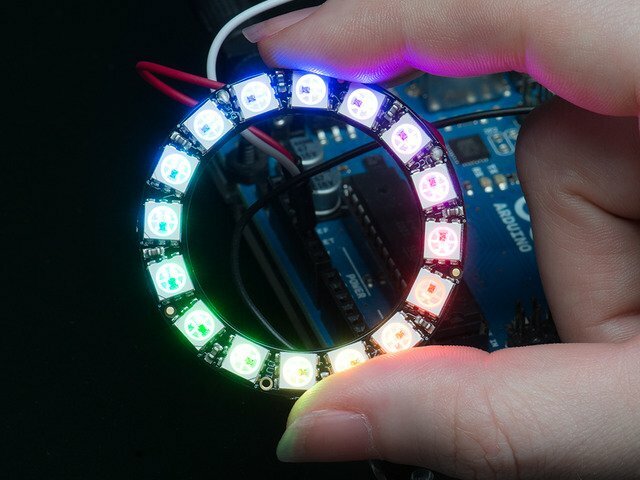 Do the same with the 24 NeoPixel ring, only through the larger channel and openings. With both the rings snapped into place, and wires pulled all the way through, group the wires together and insert them through the gemma mounting part. Secure GEMMA to a third-helping hand. Keep the ring mount and circuit close and secured. 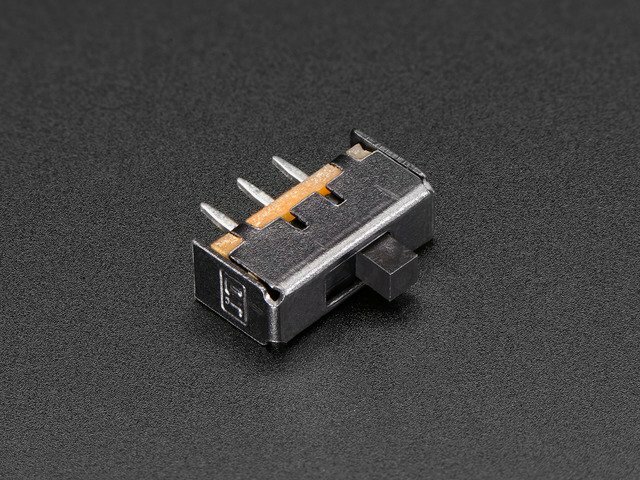 Ensure wires are through the GEMMA mounting part. Solder the red positive wire from the laser diode to 3V on GEMMA. Solder the black common ground wire to the GND pin on GEMMA. With the wires soldered, place the GEMMA into the mount part and group the wiring so that it flows through the opening near the JST port on GEMMA. Insert the laser diode in through the large respirator part with the diode going through out the smaller opening. The ring mount part is inserted through the large respirator and pushed down until it reaches the end stopper. Ensure it's all the way in by pressing the edges down. 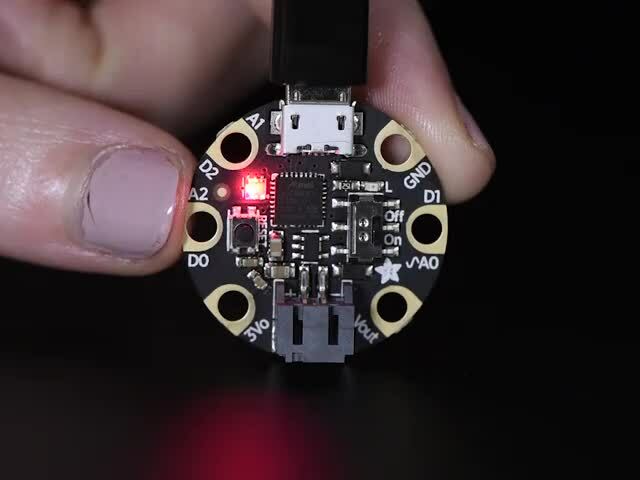 With the ring mount and laser diode installed, grab the respirator connector and pull the laser and slide switch adapter through the opening with the pegs facing towards the diode. Apply funtak (mounting putty) to the surface of the connector and press it down to the large respirator. Ensure to pull the slide switch all the way through the connector. Grab a piece of conduit and cut it down to about 5cm. Insert conduit into the circular opening in the side of the mask for both secondary respirator pieces. Grab the strand of EL wire and start threading it through one of the conduits. The secondary respirators include holes sized for EL Wire to pass through. 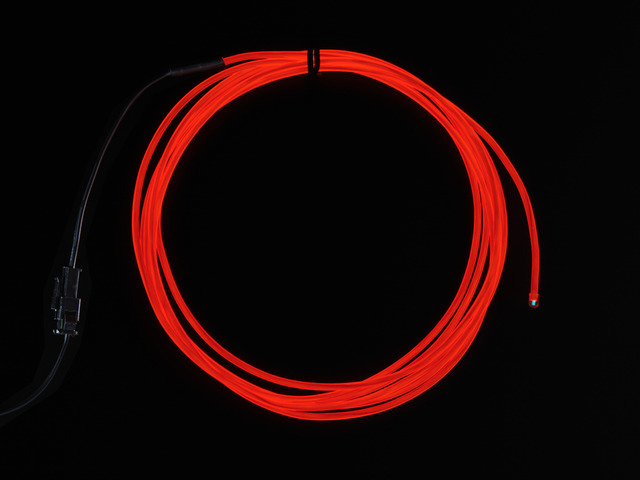 Continue threading EL Wire until you reaching the end of the part. Once the EL Wire has been threaded all the way through the conduit and secondary respirator, you'll need to pull the EL wire until you have about a quater of a meter (or just long enough be able to put the inverter in your pocket and wear the mask). You'll need about 1 meter and some slack of EL wire to thread through the two secondary respirators, the large respirator, and the two ring mounts that are placed inside the costume goggles. Insert the EL wire through the large respirator and thread it through the various openings. You can mix it up and thread it however you like, just don’t over do it - You’ll still need to thread the other side with the remaining length of EL wire. Once you have a loop or two of EL wire exposed on the large respirator, thread the remaining length through the other secondary respirator. You may want to temperarly remove the conduit to make it easier. Pull the EL Wire all the way through the side of the mask. Thread the remining EL Wire through one of the holes in the EL mounting ring. Pull the wire all the way through until you have enough to fit inside one of the eye sockets in the costume goggles. Fit the EL wire into the mounting ring by pressing it down into the channel. Thread EL wire tip through the second hole and pull all the way through. Press down the EL wire again to snap it into the ring mount. Insert the ring mount into one of the eye sockets of the costume googles. Repeat the same steps for the second EL Wire ring mount. You'll need to leave a bit of slack to allow the two ring mounts enough length to spread apart. When mounting the ring mounts into the costume goggles, orient the parts so that the EL wire is positioned towards the bottom. Insert the laser diode into the front opening of the mask part. Pull the wire all the way through and start fitting the large respirator towards the opening. Carefully fit the slide switch adapter into the opening. Orient the respirator so that the pegs line up with the openings in the mask. Press the large respirator into the mask until the pegs are visable inside the mask. 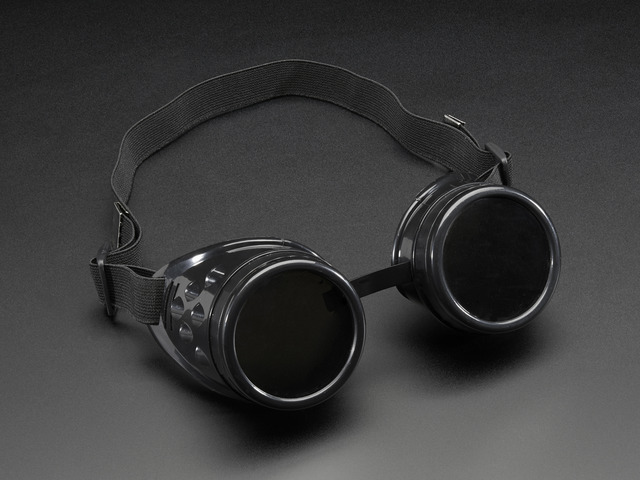 Now you can insert the secondary respirators into the holes on the side of the mask. Ensure you have enough wire in the slide switch adapter so that it is reachable when parts are assembled together. You can optionally extend the wire with a JST extension cable. Insert the laser diode through one of the EL wire ring mouts (and costume goggle). Position the laser mount part over the laser diode and press it through the opening. You may need to add a piece of eletrical tape on the diode for a tight fit. Place the laser mount part over the costume goggle socket and secure the eye cover part back onto the costume goggle. Add pieces of weather-proof foaming to the mask to make it more confortable when wearing. This roll of foam includes self-adhesive backing similar to foam tape. You can get a roll at your local super market in the DIY section. Add a piece of foam to the inside of the mask, near the nose bridge area. Insert a 500mAh lithium polymer battery into the lipo pocket part. Add a peice of double-stick foam tape to the lipo pocket and attach it to the inside of the mask. A good location for the pocket is right above the opening of the respirator. Place the LED diffuser part over the large respirator and press it down into place. Press along the edges of the diffuser until it reaches the full depth of respirator. Lay the cover over the respirator part and press it down to snap it closed. There might be excess EL Wire. If you want to hide it, you can coil it up and secure to the surface of the mask or simply let go down your ear and hind it behind your back. Maybe you want to wrap around a hat and show it off, its up to you! The EL inverter can be placed in your pants or jacket pocket. Before fitting the mask over your face, make sure there aren't any sharp or pointing parts coming from the conduit (if there's sharp edges, you can trim them off with scissors). Try adjusting the EL wire away from the bridge of your nose. Adjust the goggles and ensure the straps are fastened and tight. This guide was first published on Oct 02, 2014. It was last updated on Oct 02, 2014. This page (Assembly) was last updated on Apr 21, 2019.